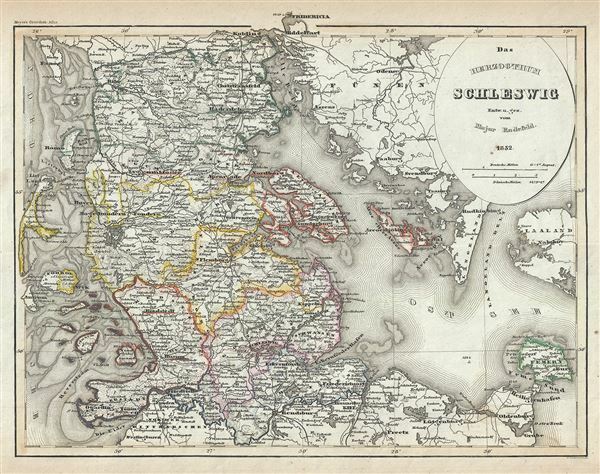 This is a scarce 1852 map of the Duchy of Schleswig. It covers from Fredericia in modern day Denmark south as far as Preetz in Germany. Includes the Fehmarn and Aero Islands. This extremely detailed map notes important cities, towns, rivers, roads, coastal features and other important topographical features. Various battlegrounds are also identified. During the time this map was made, the region was in the midst of the First Schleswig War between Prussia, Germany and the duchies of Holstein and Schleswig against the Kingdom of Denmark. In 1848, when the King of Denmark, Frederick VII, proposed that the Duchies of Schleswig and Holstein be formally recognized as part of the Danish Kingdom, the predominantly German population of the two duchies rebelled for a free constitution, resulting in war. Denmark ultimately won the war and retained control of Schleswig-Holstein following the London Protocol of 1852. In 1863 Denmark once again tried to integrate the Duchy of Schleswig into the Kingdom of Denmark by passing the November Constitution, leading to the Second War of Schleswig in 1864 between Austria and Prussia on one side and Denmark on the other. In the end Denmark surrendered control over Schleswig and Holstein to Prussia and Austria respectively. The Second War of Schleswig would eventually culminate into the Austro-Prussian War of 1866 and Prussia would annex both Schleswig and Holstein to create the new province of Schleswig-Holstein.